[chelsea] Chelsea boss Jose Mourinho is hoping to put the pressure on Manchester City by beating Crystal Palace tomorrow afternoon, although he still has a couple of injury problems. [chelsea] Chelsea may be the current Premier League leaders but Jose Mourinho believes their title rivals are at an advantage because they are not playing in the UEFA Champions League. [swansea] Swansea head coach Garry Monk has no fresh injury concerns to trouble him following the midweek draw against Arsenal for Saturday's Premier League appointment with Norwich. The Swans are currently five points above the relegation zone, and victory at the Liberty Stadium this weekend would provide a degree of breathing space for Monk's men. Monk looks set to field fit-again Michu and Wilfried Bony up front as Swansea look to take a considerable stride away from trouble. [betting]Have you made your Super 6 entry yet? Make sure you enter the free-to-play football prediction game before 3pm tomorrow for you chance to win the £250,000 jackpot, while £5,000 is up for grabs for the best attempt if no one takes the grand prize. Play here! [chelsea] Back to Jose Mourinho, who is anticipating a tough game at Selhurst Park after Chelsea laboured to a 2-1 win in December's reverse fixture. [fulham]The games are running out for Fulham as they sit bottom of the table with just seven matches remaining, starting against Everton at Craven Cottage, live on Sky Sports 1HD, but manager Felix Magath remains positive. [fulham]Felix Magath has also been giving an update on his squad ahead of Fulham's Super Sunday meeting with Everton. [ssnr]Danny Mills is so convinced Liverpool won’t win the title he’s gone the extra mile to prove his case on the latest Sky Sports Football Club from Sky Sports News Radio. There’s also Daniel Sturridge on his partnership with Luis Suarez, Robert Pires says Arsenal are still in the title race and mixed views on David Moyes from Eric Cantona, Gary Neville and Paul Scholes. [jamieredknapp]Jamie Redknapp looks ahead to the Super Sunday showdown between Liverpool and Tottenham this weekend. [cardiff]Cardiff boss Ole Gunnar Solskjaer has been speaking to the press ahead of their key clash away to fellow strugglers West Brom on Saturday, with a home date against Crystal Palace to follow. OLE: "The next two games will be massive, they're against the two teams directly around us. It's going to be a vital ten days coming up." [manchestercity]Playmaker David Silva is available for Manchester City's Premier League trip to Arsenal on Saturday, live on Sky Sports 1HD, but striker Sergio Aguero is still not ready to return to action. Reports had suggested Silva was a doubt for the contest at Emirates Stadium after picking up an injury in Tuesday's 3-0 win at Manchester United, but Manuel Pellegrini said at his pre-match press conference that the Spain international will be in the squad. Aguero, meanwhile, will miss out for a fourth game due to the hamstring problem he sustained against Barcelona, with Pellegrini indicating the Argentina frontman could make his comeback against Southampton on April 5. Don't forget to alter your Sky Sports Fantasy Football team ahead of tomorrow's games. Here's the team of the week from Gameweek 32, with Yaya Toure the standout performer having scored a hat-trick at home to Fulham as well as one at Old Trafford in midweek. Play now! [tottenham]Emmanuel Adebayor is a doubt for Tottenham's trip to title-chasing Liverpool on Sunday. The Togolese striker will have a gash on his heel assessed before the trip to Anfield, although head coach Tim Sherwood is hopeful he will be fit to be part of the squad. Kyle Walker continues to miss out with a groin complaint, while Erik Lamela, Etienne Capoue and Vlad Chiriches remain absent, although the latter will play for the Under-21s against Arsenal on Friday. [chelsea]Striker Samuel Eto'o is out of Chelsea's trip to Crystal Palace with a hamstring injury. Willian is available after serving a one-match suspension, but Ramires is banned for two more games following his dismissal in the controversial loss at Aston Villa. Left-back Ashley Cole (knee) is still out and midfielder Marco van Ginkel (knee) is continuing his rehabilitation by playing for the under-21s. [chelsea]Jose Mourinho continues to play down Chelsea's title chances, despite their position at the summit of the Premier League. [recommend]You could win £250,000 this weekend, simply by predicting six correct scores. 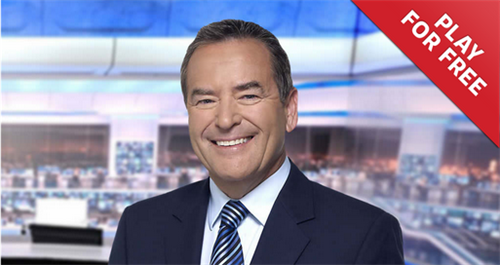 Here's Jeff Stelling with his Super 6 preview. [football]It's a critical weekend in the Premier League, with key fixtures which will impact on matters at both ends of the table. 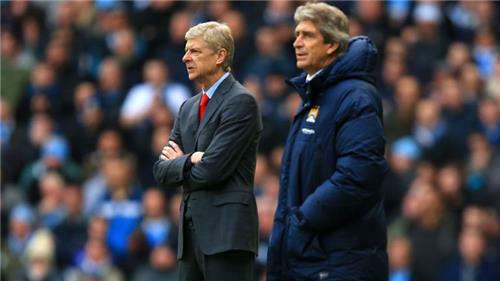 Here's our preview of all the action which takes place on Saturday and Sunday. A sneak peak of the banner which is due to be flown over Old Trafford ahead of Saturday's match with Aston Villa. [betting] Sky Bet have reported a run of bets on Steve Claridge to be appointed as the next permanent Portsmouth manager, prompting his odds to come in from 7/1 to 5/6 today, with caretaker boss Andy Awford drifting to 9/4. Find Sky Bet's manager markets here. Soccer Saturday's Tony Cottee says the scoreline doesn't reflect the performance from Manchester United. They've not played particularly well, but it's a big three points for United. [betting]Here's how the Premier League title odds look ahead of today's 3pm kick-offs, how will they look by the end of the weekend? Bet here. You can listen to Soccer Saturday on our online radio station. Simply click here to tune in. And you can catch up with clips from the show on our Soundcloud page. Oh, crucial intervention from Ward because that Azpilicueta ball across goal seemed a sure tap-in for Schurrle. Palace's full-backs having a busy afternoon already. Only West Brom doing the business in the 3pm kick-offs but how Southampton aren't ahead is beyond me. Lovren has a free header, before Lambert - from a tightish angle - makes Elliot work again. He might want a word with Gouffran, the stopper: he laid the ball right into the striker's path. Shelvey's cross is a good one and locates Michu, who is slightly slow to react and can only stretch to stab the ball wide. Lovely stuff from Swansea. Routledge shows great purpose and drives for goal before exchanging passes with Michu. The Spaniard's lay-off is delicate and allows the winger to poke goalwards, only for Ruddy to tip the ball away from the far corner. Greedy from Odemwingie. He has several options ahead of him but tries a spectacular from 30 yards. It's poorly struck and off-target. This is the best chance so far! Mariappa prods into Puncheon's path but there's so much pace on his cross it catches Bolasie by surprise; he dithers between volley and stooping header and ends up on his backside, the ball in the side-netting. The Swans are threatening to leap-frog their visitors in the Premier League table. It's a scrappy build up as the ball ricochets off Michu's back into the path of De Guzman, but his 18-yard left-footed strike is a sweet one. Ruddy is perhaps unsighted but it's a good finish nonetheless. 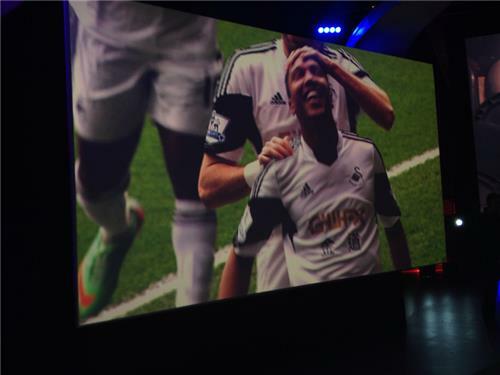 A very happy De Guzman, as snapped on the giant screens in the SNF studio. Is it a cross? Is it a shot? It matters little - it's a goal. Mutch cuts inside and appears to be trying to locate Campbell with his delivery... but the ball drifts perfectly into the far side-netting. Foster had no chance and both goalkeepers have been left slightly embarrassed this afternoon now.